rec. October 2013, Kirche St. Ansgarii, Bremen. The son of an organist, Sebastian Knüpfer became cantor of the St Thomas Choir in Leipzig from 1657 to 1676, and director of the city’s music. Quite a bit can be read in the booklet notes about the history leading up to his working life, and that he “had become an important musical personality in Central Germany... some of his works regarded as forward looking in their compositional design.” Of the works that can be traced, only about half seem to have survived, but this recording provides substantial evidence as to the quality of his sacred music. "Knüpfer loved large forms, the lavishness of the Baroque. He worked with the full orchestral apparatus, pulled all the stops in the colour of the tonal ensemble, and also attached importance to the opposition of different orchestral groups, in a manner similar to Praetorius..." Veronika Greuel's booklet notes sum up the sonic effect of these cantatas very well. More intimate passages contrast with sweeping grandeur, but there is subtlety and richness in every corner of this recording and if, like me, you've never heard of this composer, then you are in for a very pleasant surprise indeed. All of these works are very fine, but I was stopped in my tracks by the Super flumina Babylonis or ‘By the rivers of Babylon’, which has a gentle beauty and some stunningly expressive harmonic passages. All of the texts are printed in Latin, German and English. 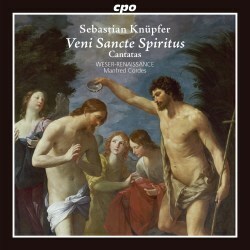 Consisting of around 35 musicians, the Weser-Renaissance Ensemble of Bremen has plenty of power in reserve for the most spectacular moments in these cantatas, and the elaborate final Surgite populi has spectacular drums and a full consort of brass to honour the risen Christ and send us off with a feeling of true elation. As is to be expected, this is a very good recording, balanced nicely in its spacious church acoustic but with plenty of detail and a pleasantly wide soundstage. Knüpfer's music has appeared before in recordings though by no means in any large quantities. You may have come across The King's Consort on Hyperion (review), but the well-chosen programme on this CPO release will come high on anyone's list when it comes to this elusive composer.